Juki has the world's largest share of industrial machines which are sewing your clothes, shoes, sofas, curtains, etc. Juki has been chosen by world famous manufacturers because of their high quality and reliability. The same qualities are in your Juki home sewing machines. WHY NOT TRY A JUKI for yourself. Purchase your Juki machines from Zoelee's for service, knowledgeable instructions, PLUS Juki's factory guarantees!! 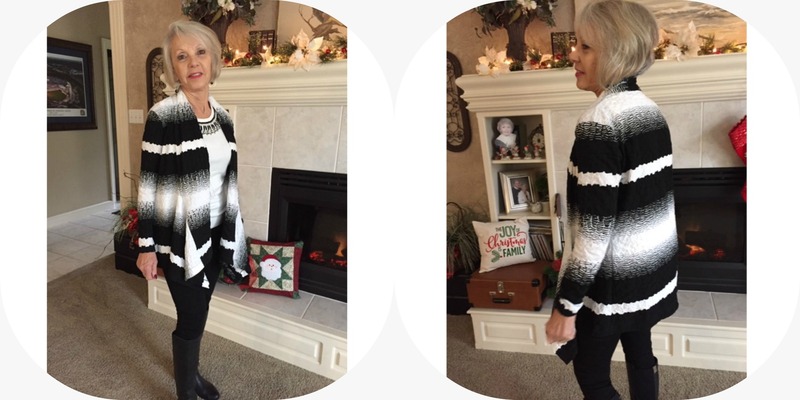 Beautiful classic black and white jigsaw stripe texture knit makes for a classic look using Ann's Cardigan pattern by The Sewing Workshop. with a few changes when working with a striped fabric. Great for any season. A touch of sparkle for the Holidays using this beautiful sequin sparkle Lycra knit with shades of black on white. 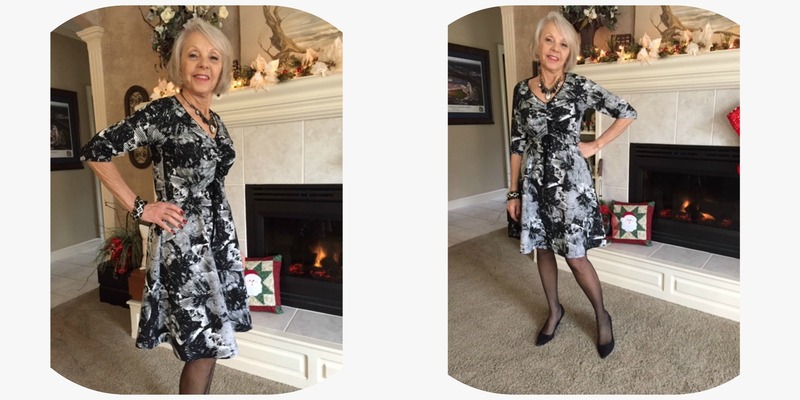 Quick and easy pull-on fitted dress with a front drawstring ribbon front, creating gathers at the front bodice from McCall's M7812. Used stretch pipping for an easy, quick professional finish at the neckline. Macy and Halia just started sewing lessons and are having so much fun learning to sew. Addison showing off her tote bag and Kiley showing off her favorite Teddy bear she made. Gift Certificates are available for preteens/teens and adults for Christmas. Sewing lessons are the best investment that will give them a lifetime of skills they will use all their lives. Starting in the class room learning to cut out patterns, creating many projects from a pillow case, tote bag, teddy bear and other fun projects that give them a sense of accomplishment while building good sewing skills. Zac just finished his first T-shirt from one of our Chico Designer Knits. He is very proud to learn how to work with knits, learning the quality of fabrics and construction, learning and understanding patterns. along with tips and techniques to make his T-shirt look very professional. His statement once he finished his shirt. "I love making garments." Zac just purchased his first Juki Sewing machine and is ready to go forward to his next project. GOOD JOB! A great gift idea is a Gift Certificate that can be used a variety of notions, patterns, quality garment fabrics like no one else in Kansas City. Juki Sewing machines and serger's. We are your local Juki dealer and service rep for every machine we sell. New fall colorful fabrics, lots of options for sewing projects. Buying fabric on the internet is becoming a practical task!! We make sure we're carrying quality, exclusive fashion fabrics, designer knits, textures and designer cottons! If you're new to this fun pastime, give us a call and we can be your eyes and hands, answer questions, make suggestions for patterns, and we will send SWATCHES! We will send you up to 4 swatches at no charge. 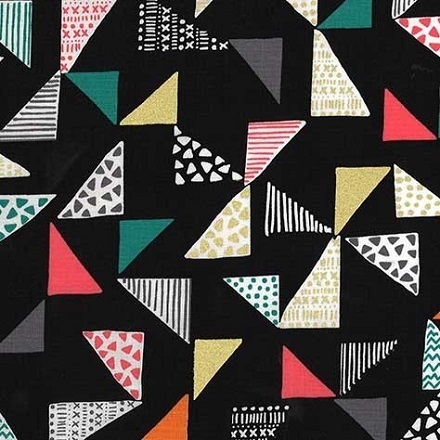 Remember that many of our fabrics are in limited quantities, when it's gone, it's gone. If you find something you really like, call me and I'll be glad to set aside any quantity you want to purchase. We service all brands of Sewing Machines & Sergers -- 30 day warranty!! Very important to maintain your machines for excellent performance! !